Accent your bedroom off with this exciting contemporary designed night stand. It features two drawers with shaped overlay fronts with aged bronze colored hardware. 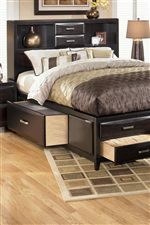 It will complement the rest of this bedroom furniture and be a great piece to store all those 'odds and ends' lying around your room. Place beside a bed and use for a lamp, alarm clock or whatever you desire. 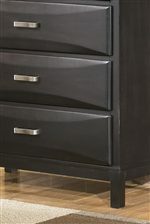 The Kira 2 Drawer Night Stand by Ashley Furniture at AHFA in the area. Product availability may vary. Contact us for the most current availability on this product. Storage 2 drawers of storage space.